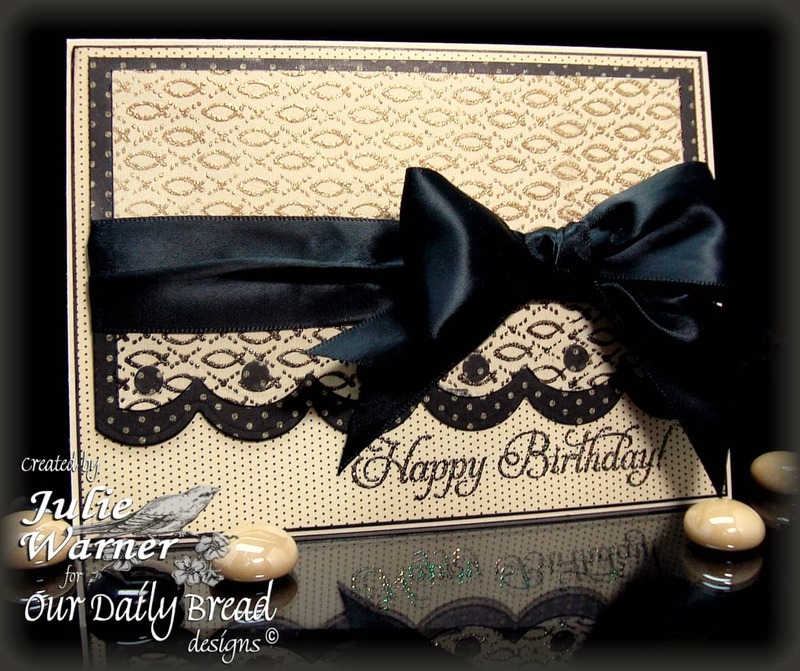 It’s my day to post on the DRS Designs Blog. I hope you’ll drop by to check out my card and leave me a note. 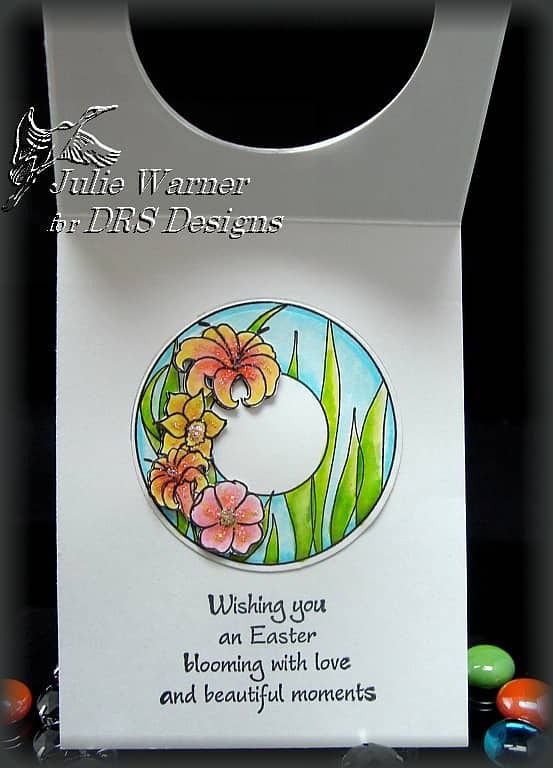 I love this Spring Flower Suncatcher image and it not only works wonderfully for Easter, it would also make lovely Spring cards for birthdays or Mother’s Day. The Suncatcher was stamped twice and colored w/ markers. 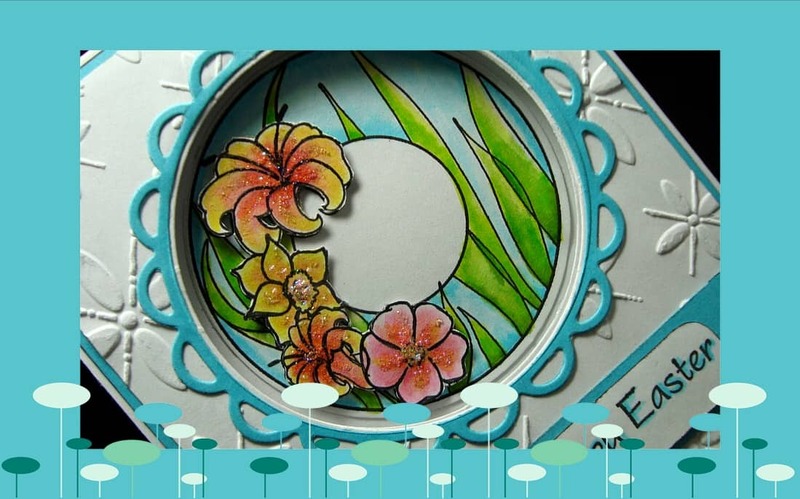 One was die cut w/ a circle die and I cut out just the flowers from the second image and layered them on top of the base image. After using an embossing folder on a piece of white c/s, I layered it onto a larger turquoise piece and then onto the 4.25 x 5.5 white card. 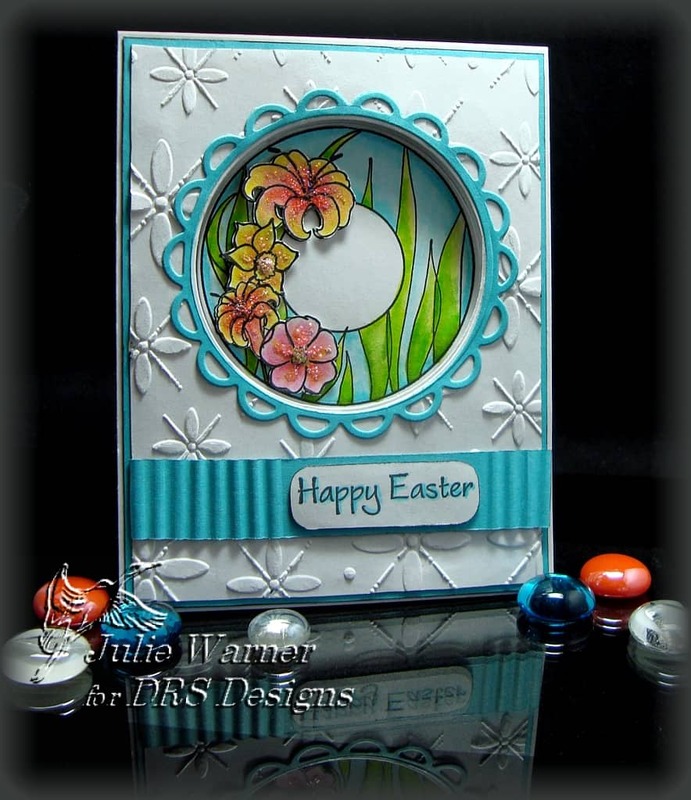 Using the same circle die, I cut out a circular window through the layered card front and attached my image on the inside of the card. I had such fun w/ the first card, that I decided to try another. This time I chose Hello Friend. I kept the same layout and scallop borders but used different images, papers and ribbon treatment. All images are Our Daily Bread designs. On the plainish pc of dp, I embossed the fish bg. I inked the area above the ribbon w/ the gold ink and the small section below the ribbon w/ the black ink then embossed w/ the sparkly ep. 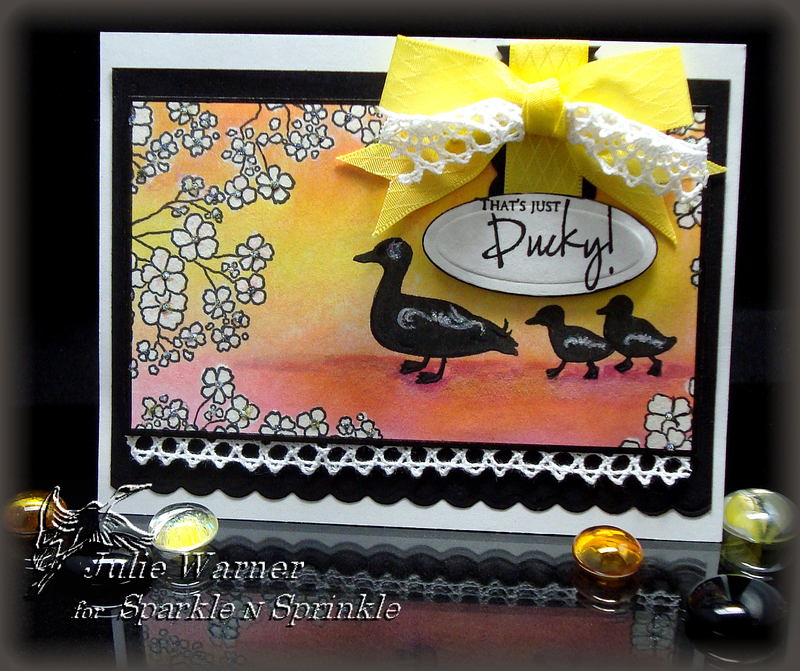 I used a QK scallop border die on the bottom of this as well as the black dot dp. I added some holes punched out of the blk dot dp on the scallops. The greeting was embossed on the small vanilla dotted dp and it was edged w/ marker. I added the wide ribbon and a bow before attaching everything to a 6.25 x 4.50 vanilla card. 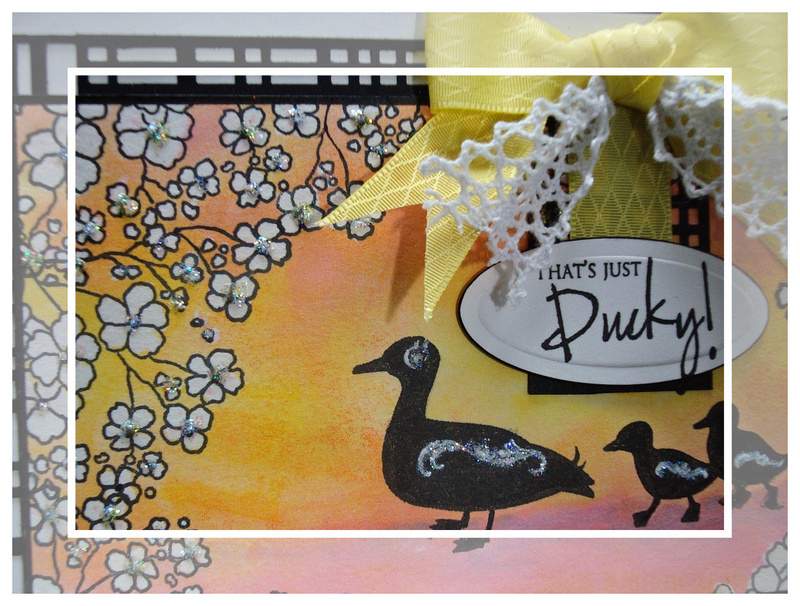 Sparkle N Sprinkle & Really Reasonable Ribbon Blog Hop! Welcome to our February Blog Hop! We at Sparkle N Sprinkle are teaming up with the crew at Really Reasonable Ribbon to show you some amazing projects using SNS glitters, flocking, stamps and embossing powders and some really pretty ribbon from the February Ribbon Kit from RRR. If you came here from Cheryl Walker’s Blog, you are in the right place! If not, you may want to go to Really Reasonable Ribbon Blog so you’ll be able to start from the beginning. For my card, I started by doing a brayered background on white c/s using only the yellow/orange/pink sections of a rainbow pad. 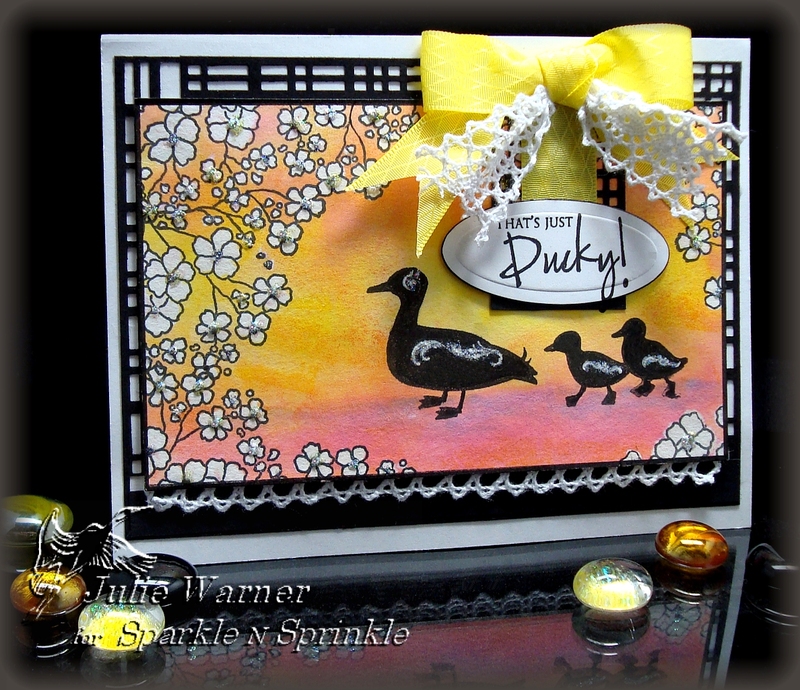 All of the images were then stamped using black ink and I sponged on a little more color under the ducks. With a very small acrylic paintbrush, I applied bleach to the flowers. Since I used a non-waterproof dye ink, the color bleached out perfectly. I used a white gel pen to help accent the swirls on the ducks and then applied glue to these areas as well as the flower centers. I sprinkled on Sparkling Snow glitter on some flowers and Sunny Daze glitter on the rest then edged it w/ a black marker. The only real difference in these cards is the treatment of the black layer. On the top version, I used a border punch on three sides and on the bottom version, I used a scallop edge die. On both, the sentiment was die cut w/ a small oval die and part of the crochet lace ribbon was added at the bottom of the image panel. I used a sunny yellow diamond ribbon for my bows and threaded a piece of the same crochet ribbon through the knot. Both are attached to 5.5 x 4.25 white cards. In addition to the Really Reasonable Ribbon blog candy, Sparkle N Sprinkle is giving a stamp set to one lucky hopper! Leaving a message on every blog increases your chances of winning, because it’s a mystery which of the artists’ blogs has been chosen to house the prize! On Tuesday February 15, a name will be drawn from the comments on the mystery blog. Winner gets to choose a stamp set of their choice from SparkleNSprinkle.com! Next, hop on over to True SJolander’s Blog. I’m sure she’ll have something wonderful to show you!